Plastic lenses can yellow with age, reducing headlight brightness, and new lenses can be expensive. 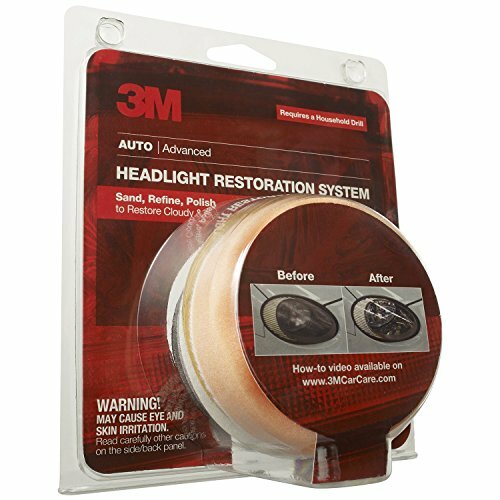 The 3M Headlight Lens Restoration System lets you shine and restore plastic lenses, including headlights, taillights, fog and directional lights. By restoring clarity to the lens, the performance of the headlight is improved and the appearance of the vehicle is enhanced Now you can produce professional results with the 3M Headlight Lens Restoration System and a household drill (1200-1600 rpm). Kit includes all items necessary to perform the task except for the drill, tape and clean cloth.